Norse mythology comes alive in the epic new Asgard slot from Realtime Gaming. It arrives at Golden Euro Casino on Wednesday. An introductory deposit bonus that includes 10 free spins will be available until the end of December . The new Viking-themed game has four progressive bonus features that start by awarding free spins with win multipliers and extra Wilds and end with morphing symbols. Inspired by Marvel’s Thor: Ragnarok movie, Asgard is an All Ways Pays game featuring mythological Norse gods -- and Golden Wilds that double wins. 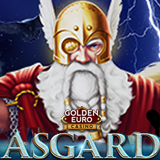 Goldlen Euro Casino is giving 10 free spins on new Viking-themed slot with 100% deposit bonus (until Dec. 31, 2017). Three or more scatters trigger a series of bonus features. During the first five free spins, the Goddess Feature can award 15 free spins with prizes tripled. After the fifth free spin the Loki’s Magic feature is unlocked and 20 free games with an extra Wild symbol added to the middle reel can be triggered. After the tenth free spin the Thunder God feature can grant 25 free spins with up to 6X win multiplier. Finally, there’s the Valhalla feature that gives 30 free spins with morphing symbols (winning symbols change into new symbols that can create additional winning combinations). Until the end of the month, Golden Euro is doubling deposits and including free spins on the new game. Golden Euro Casino’s Advent Calendar continues to give a Free Spin Bonus on a different game every day up to Christmas Day. There are free spins on the casino’s most popular slots, like Panda Magic and the new Purrfect Pets. Christmas slots like Naughty or Nice and the brand new Swindle All the Way will also be featured.